"Since much of the media coverage surrounding the bill has been critical (57.3 percent of respondents viewed the coverage as biased), these numbers provide insight into what the biggest job creators in the country are expecting to gain from the new tax relief," the survey explained. Many business owners were also concerned with being able to offer affordable insurance to their employees and increasing health care costs. There were 62.9 percent of small business owners who said that high costs had prevented them from offering coverage to their workers and 76.5 percent said they were concerned about health care costs this year. Many small businesses supported the Trump administration's directive to expand association health care plans, which allows businesses to pool together to offer more affordable care. Alfredo Ortiz, president of the Job Creators Network, said that the Tax Cuts and Jobs Act is having a positive effect on businesses, represented by recent announcements that businesses are offering bonuses and benefits because of the tax law. 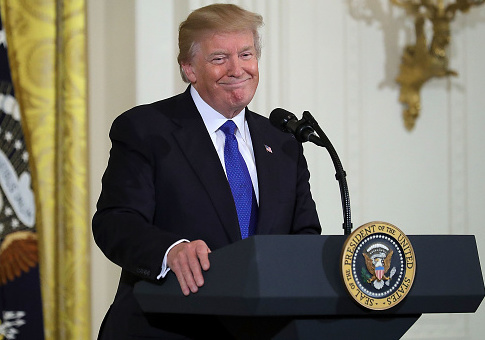 "As revealed in these survey results, small business owners and their employees are solidly behind the policy pursuits of President Trump," Ortiz said. "The historic tax cuts legislation is already having positive impacts on small businesses and our economy—financial savings are being directed towards employee bonuses, wage bumps, increased capital investment, and business expansion." "And Obamacare—a set of regulations that have caused health care costs to skyrocket—continues to be addressed by the Trump administration, which is working to replace it with a policy that will work for all Americans," he said. "Small businesses are behind the president's moves to slash burdensome regulations and promote pro-business, pro-growth policies." This entry was posted in Issues and tagged Small Business, Tax Reform, Trump Administration. Bookmark the permalink.